- Publisher Once the honeymoon's over, many husbands and wives are shocked to discover how different they really are! Those traits that seemed so appealing before the wedding suddenly become stress points in daily living. LaHaye explores the four basic personality types to provide hands-on tools and biblical insights for turning personal differences into marriage-enriching experiences. - Publisher Gives couples hands-on tools for turning personal differences into marriage-enriching experiences. Tim LaHaye, who has sold more than 8 million books, helps couples understand their strengths and weaknesses, and offers steps to build a dynamic relationship. Once the honeymoon's over, many husbands and wives are shocked to discover how different they really are! Those traits that seemed so appealing before the wedding suddenly become stress points in daily living. LaHaye explores the four basic personality types to provide hands-on tools and biblical insights for turning personal differences into marriage-enriching experiences. Gives couples hands-on tools for turning personal differences into marriage-enriching experiences. 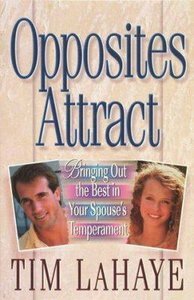 Tim LaHaye, who has sold more than 8 million books, helps couples understand their strengths and weaknesses, and offers steps to build a dynamic relationship.